Hugh Dorward was born in 1886, and attended George Heriot’s School from 1900-1902. He worked in the Treasurer’s Office, Royal Infirmary. He was a Private in the Royal Scots 1904; Corporal; Sergeant; mobilised in August 1914. In March 1915 he fought at Gallipoli and was killed in action on 23rd May 1915. He was the youngest son of Mr Hugh and Mrs Isabella Dorward, 36 Warrender Park Terrace. 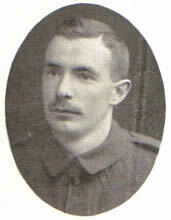 He died at the age of 28 and his name is on the St Michael’s WW1 memorial.